Ruth: How did you come to Revision Urban Farm? She sent me the application and told me a little bit about Revision. I loved the idea of what they did and stood for. Revision has been around for almost 30 years. It started as a community plot next to a shelter. Then about 13 years ago Victory Programs merged with Revision, and eventually expanded and acquired more land and added a greenhouse to their territory. We currently have three markets, a CSA program, donate to 3 of the shelters under Victory Programs, have a Youth program during the summer, and have a Job Readiness Program. The Job Readiness program consist of some of the women in the shelters to intern for 6 weeks on the farm to develop leadership skills, interpersonal skills, resume building and practical hands on experience while they are on site. Victory Programs, which oversees Revision, has shelters and recovery homes within the Boston area. What appealed to me was the fact that their program had farming and fresh produce attached to their other services. Growing organically and with such a great mission in the city, really called to me and spoke to me on a lot of different levels. I also wanted to learn how to grow in the Northeast. Both my parents grew up on farms in the Caribbean so I just wanted to know what it was like to grow in this climate. Ruth: How did you come to permaculture? Charissa: Permaculture to me was always very intuitive. My thought process was always very permaculture like, ever since I was a kid. I remember learning and being fascinated with science and stuff about the universe and thinking about all the interconnectedness of everything I was learning and seeing. All these interconnections amazed me and I felt like it just proved to me that there was a God, and that everything was created with intention and purpose. So I would have these conversations with Joy about my ideas and she said, “Have you heard about Permaculture? All these ideas you have are very Permaculture like.” Joy had taken some courses with Lisa Fernandes and that’s how I heard about her program with the Resilience Hub. I looked up and researched permaculture and a lot of the ideas and philosophies behind it all made sense to me. I was so glad there’s people out there doing it. I ended up taking the Resilience Hub course and absolutely loved it. I felt like I was at home. Not just what I was learning but the people that it had attracted – so many people from so many different backgrounds. Because it’s not just about growing plants, it’s the interconnectedness of everything that we do. Ruth: Had Joy started the Permaculture at Revision? Charissa: I think she wanted to but didn’t want to impose on what was already going on. When I came on I said I think we should do it. So right now we’re looking to not just grow organically but be more sustainable and add more permaculture design to the farm. Ruth: How will the mission of Revision help to be fulfilled by Permaculture design and practices? Charissa: I think the original vision for the farm was to create a space of community and healing, and over the years the farm has had different iterations on how to accomplish that. When I came in there was a lot that needed to be revamped and I felt like aligning these permaculture ideas to our mission was the perfect fit. As a nonprofit you have to be pretty mindful of what resources are available, what’s good for the earth, and address social justice issues within the community. I felt like all of these factors could be addressed with a permaculture design that could meet all of our needs and mission. The main design is completed. We have been in the process of implementing the design by sheet mulching and contouring some of the beds. Everything is based off of spirituality for me and I knew that coming to Revision was intentional, and that God wanted me to be here for a reason. So not only has it been very cool to design a very practical and efficient sustainable system, but to also to gain a lot of life spiritual lessons through the process, has been really healing. 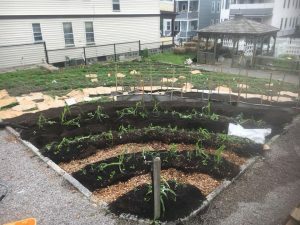 For me, what I like about permaculture and what it means to me is it’s not just some design technique, it’s kind of a mind-body spirit thing. It’s more meaningful than just growing things. It’s a way of life.